Concours of Elegance has revealed the full list of spectacular cars which will appear at Hampton Court in less than a month’s time. Taking place from 1-3 September, this celebration of automotive elegance, style and passion will feature more than 60 of the rarest and most exclusive cars ever produced. From iconic pre-1914 automobiles to limited edition sports and supercars of the 21st century, each of the Concours of Elegance cars has a remarkable story to tell. Star cars include the first automobile ever to get a speeding ticket, the 1896 Arnold Benz Motor Carriage, a host of Le Mans hero Jaguar D-types and the UK debut of the incredible Maserati A6G ‘Barn Find’. In addition, there will be a brace of rare and important Aston Martins – from the 1923 ‘Clover Leaf’ to the DBR09/01 racer – and a stampede of Ferraris to celebrate the Prancing Horse’s 70th anniversary. Concours of Elegance has picked out a handful of the incredible cars confirmed to appear in the Hampton Court Palace Gardens. One of only eight examples, this Bentley is not only incredibly rare but it also packs a remarkable story. Originally built in 1928, the car was purchased for £280 in 1962 by a teacher, Stuart Wallace, who quickly realised that he couldn’t afford to run it, so began a process of stripping and restoring it. However, he never finished the job and when he passed away, his daughter brought in specialists William Medcalf Vintage Bentley, who were tasked with preserving it. The trouble was Mr Wallace had spread parts of the car throughout the house – with an engine block found in the entrance hall, a clutch on the stairs, a headlight under the bed and components in the garden. William Medcalf tracked down all of these original parts and meticulously preserved the car. Apart from a few new wooden supports added to the body for strengthening, not a single nut or bolt is new. The result is an incredibly original and rare machine with a wonderful story to tell. The Tatra 77, launched in March 1934, was not only the world’s first series production aerodynamic design (the work of Paul Jaray, ex- Zeppelin), it also featured plenty of other innovations. Most notable among them was the compact three-litre air-cooled V8 behind the rear axle to which used Elektron, a lightweight aviation magnesium for the crankcase and gearbox casing. Capable of nearly 90mph, the 77 was very quick for having just 60bhp, and very quiet thanks to its impeccable aerodynamics. This fine example was one of the first Tatra 77s in private ownership. It was delivered to Dipl. Ing. Jozef Wait, a Czechoslovakian entrepreneur, on 30 November 1934, and featured the unique option of a full-length Webasto sunroof. The Walter M. Murphy Company of Pasadena, California, built around 60 Convertible Coupe bodies for the Model J Duesenberg series. The earliest of these cars had a top that folded behind the driver’s seat but remained exposed, a design that later evolved into one that was covered by a leather tonneau. The true ‘disappearing top’ cars – of which less than 25 were made and like the model set to appear at Hampton Court – replaced the tonneau with a flush metal lid, and were combined with extra thin window pillars and side windows that also disappeared, turning the car into sleek roadster. These full customised cars are incredibly rare and were built to individual specifications by extremely wealthy buyers. With power from a 6.9-litre 265bhp straight eight-cylinder engine, the Model J Disappearing Top is one of the most beautiful Duesenbergs ever made. Originally crafted by Italian coachbuilder Castagna for an Alfa Romeo 8C 2300 Lugano, this stunning body now sits upon a chassis for a V8-engined Lancia Astura Series 2. Remaining in Italy during World War Two, the Lancia was then moved to the UK where it was enjoyed and restored by various owners. In 1982 it made its way into the Rosso Bianco Museum in Germany where it remained for a short while. Its current owner acquired the car in 2006 and had it restored to original specification by specialist Paul Grist. In 2016 it was awarded the Coppa d’Oro at the Villa d’Este concours. 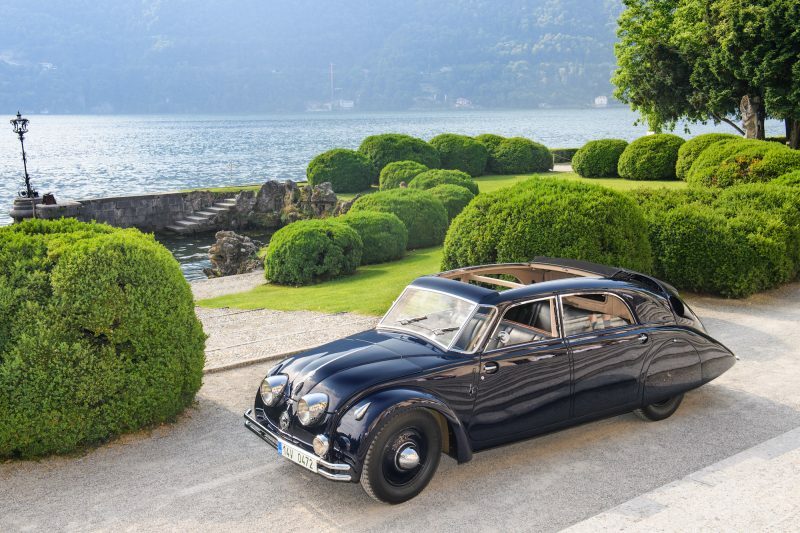 This remarkable car was the idea of Jean Daninos, owner of French coachbuilder Facel-Métallon, who asked Italian design house Pininfarina to pen a two-door fastback based on the chassis of a Bentley Mark VI. The striking result was code-named the ‘Cresta’ and was exhibited at the 1948 Paris Motor Show. Understandably, it created quite a stir – with a host of prospective buyers excitedly placing orders. The car was then taken to the Geneva Motor Show the year after where further orders were received. Apart from a modification to the radiator grille – a request made by Bentley itself – the car was put into production almost unchanged from the motor show version. Pininfarina is rumoured to have built 17 cars in total at its base in Turin, although it is thought that only 10 were ever delivered, making this car one of the rarest in the world. With its eye-catching Harrods-sponsored yellow and green livery, chassis #06R is one of the most famous of the seven F1 GTRs built by McLaren. Raced throughout the 1995 and 1996 seasons, it achieved a podium position at the 1995 24hrs of Le Mans in the hands of Andy Wallace and Justin Bell. Such was the impact of that famous livery that when McLaren launched the P1 GTR in 1995, it paid homage to its predecessor with identical yellow and green paintwork. Packing a 986bhp 3.8-litre twin-turbo V8 with an enhanced electric motor, the track-tuned race car is 50kg lighter and achieves 10 percent more downforce than the road-going version. Both cars will be present at Hampton Court offering a unique opportunity to see two pieces of McLaren’s competition history in the flesh.